Super Eagles manager, Genrot Rohr, may line up Leicester City midfielder, Wilfred Ndidi, in tomorrow’s pre-World Cup friendly against Czech Republic. Ndidi is still battling to be fully fit for the World Cup. The Foxes midfielder has not participated in full training with the Super Eagles since the start of their World Cup training camp, but Rohr is said to be considering including his name in the starting line up tomorrow to test his match fitness level according to allnigeriasoccer.com. The Super Eagles did not hold a full training session last Friday evening as a result of the inclement weather in London, and on Sunday morning, they didn’t work with the ball again. But yesterday morning’s workout, which lasted for just over one hour was more a recovery session, as the players were only involved in running exercises. They trained fully in the evening yesterday from 1700 hours. 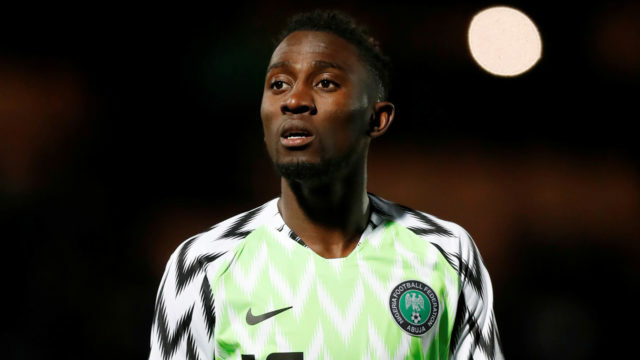 Gernot Rohr said in a post-match after the friendly against England that he was confident Ndidi will make the starting line-up against Czech Republic. “We have a programme from Leicester and my friend Claude Puel gave me very good information with the medical team. Wilfred Ndidi suffered a hamstring injury in Leicester City’s 5-0 loss to Crystal Palace on April 28, and was expected to be out of action for six weeks. Meanwhile Ndidi has been rated the most valuable Nigerian player ahead of the 2018 World Cup. The CIES Football Observatory research group has published a list of the hundred most valuable players in world football, with the Super Eagles midfielder occupying the 79th position. The Neuchâtel, Switzerland-based organization has recommended that clubs interested in the signature of the Foxes number 25 should be prepared to cough up €62.7 million (approximately N26.2 billion) for his services. At 171.3 million euros, Liverpool winger Mohamed Salah is the most valuable African player in the top five European Leagues and ranked fifth overall, followed by Arsenal striker Pierre-Emerick Aubameyang who is valued at €95.6 million and Senegal star Sadio Mane (€91.6m). Tottenham Hotspur striker Harry Kane (€201.2 million) is the most expensive player in the world, ahead of two Paris St-Germain players, Neymar (€197.5 m) and Kylian Mbappé (€186.5 m).